Available as low as $2.49 per oz over spot! The Molon Labe collection of silver rounds for sale from Intaglio Mint started with a singular design and one version of the round. Now, the selection has grown to include 1 oz silver and 2 oz silver rounds available in two different versions. More impressively, the selection has grown to feature three different images of Spartan warriors. Today, the original design is available on the 2 oz Silver Molon Labe Round Type I at Silver.com. Available to ship to you inside of protective flips and tubes of 10 rounds! First design issued in the Molon Labe collection! On the obverse is a Spartan soldier with a battle scene depicted in the background. The reverse features the Intaglio Mint logo. Sparta was one of the more powerful city-states of Ancient Greece. Though the region did not follow one leader and have one central government as it does today, Ancient Greece was capable of coming together to form foreboding military forces when the greater region faced a serious threat. At the heart of most of those defenses were the elite soldiers of Sparta. All 2 oz Silver Molon Labe Rounds in this listing are available to you with a protective plastic flip. Multiples are offered in tubes with 5 or 10 rounds. The rounds feature the first design used in this collection and reflect the battle-hardened resolve of the Spartan Army. Young men in Sparta were taken from their family homes at a very young age, sometimes as young as three of four, to begin their careers in military training. Spartans trained to fight in the phalanx formation and became the most feared fighting force in the world at the time, often capable of winning battles when faced with a numerically superior foe. 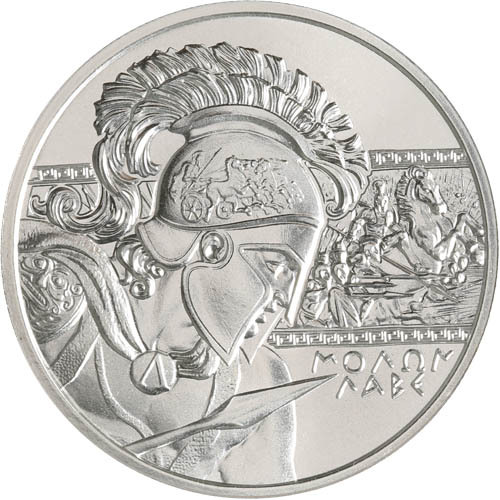 On the obverse of the 2 oz Silver Molon Labe Round is the design of a Spartan warrior in left-profile relief. You can see his Spartan helmet and the cape that clasps around his chest. The tip of his long spear is visible in the foreground, and behind him is a strip design section with battle scenes playing out. In that element, other Spartan warriors march and ride into battle to crush their foes. The reverse of 2 oz Silver Molon Labe rounds includes the image of the Intaglio Mint’s logo. 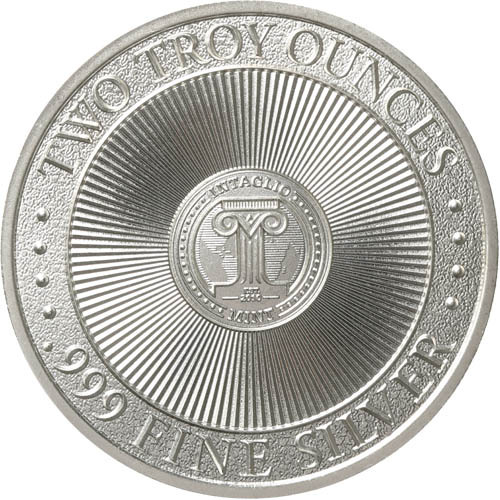 “Two Troy Ounces” and “.999 Fine Silver” are inscribed along the design rocker which has a stippled background to it. The remainder of the background field in the center has a radial sunburst design behind the mint logo. Please feel free to reach out to Silver.com if you have any questions. You can call us at 888-989-7223, chat with us live online, or simply send us an email with your inquiries.